Apply as a Trio for the Birkie Experience of a Lifetime! Each year, the Birkie selects a trio of skiers to portray Birkebeiner warriors, Torstein & Skjervald, and Inga, mother of Prince Haakon. 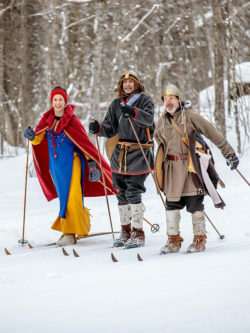 The three characters played a pivotal role in Norwegian history when in 1206, amid civil war, the two Birkebeiner warriors, skied through the mountains and rugged forests of Norway smuggling Prince Haakon, the Norwegian King’s son, to safety, the very legacy of the Birkie race. The selected skiers reenact the historic flight on wooden skis and in full period costume along the entire Birkie 55K classic cross-country race course, serving as Birkie Ambassadors, engaging with skiers and spectators along the way. The dramatic journey culminates when Inga, the baby Prince, Torstein, and Skervald, ski up Hayward’s snow-covered Main Street amidst cheers from spectators and skiers alike as they make their way to the finish line. It is a true celebration of the legacy and tradition of the race. 2019 Warriors & Inga applicants are being voted on. Stay tuned for the 2019 Warrior & Inga Contest Winners! Gather your family or friends and apply as a trio – Inga, Torstein, and Skjervald. If you have an infant (no older than 12 months) who can serve as Prince Haakon for two blocks on Main Street, that’s great! If not, we’ll supply the baby Prince Haakon. You need not have an infant to be considered. The contest opens on November 1, 2018 and closes on December 1, 2018. The ABSF will supply the warrior and Inga costumes. If you ski as a Warrior or Inga, you will receive credit for completing the race. Each member of the winning group will also receive a free Birkie or Korte race entry for the following year.